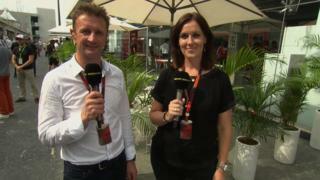 Lee McKenzie is joined by Allan McNish as they look back on Friday practice for the Brazilian Grand Prix. Lewis Hamilton was fastest in first practice but Rosberg was was 0.458 seconds quicker than his team-mate in the afternoon session. Rosberg admits he is not taking anything for granted, saying that was only down to Hamilton having the settings wrong on his engine.